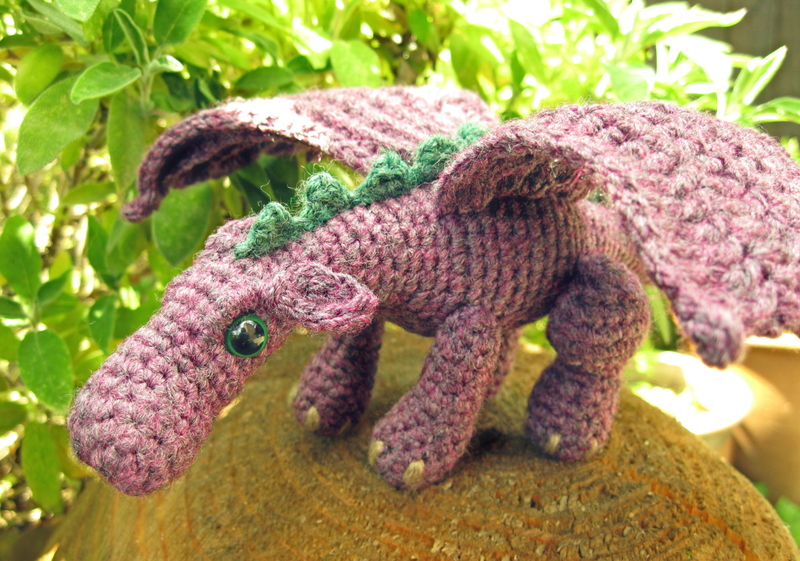 One of the first crochet patterns I wrote was for a dragon - my 'fierce but friendly really dragon'. I love dragons, and it's hard to find nice toys of them, so that was a real incentive to make one myself. Lots of people liked it and asked for the pattern, so eventually I wrote up my notes and put them on Craftster and Livejournal. The notes were quite rough, and though many people had no problem following them, some asked if I could write the pattern up properly. And, finally, I got round to it! I had to make a dragon to check the pattern, and while I was doing that I tweaked a few bits - I used to crochet a lot more loosely, and I found some parts came up too small - and I used different stitches on the wings to make them much stiffer. Edited to add: this pattern has now been translated into Spanish by Ana, over at her blog. Oooh!! Thanks!!! I love dragons too!! Your dragon is very nice! He has kind eyes and he is of my favorite color. Thanks a lot for sharing and for the pattern! Thank you! I hope you all have fun if you make your own dragon. Thank you for sharing. A friend of mine actually was oogling this dragon on craftster last week. I contacted her right away to let her know you have been kind enough to share. She is uber excited. Thanks! If you or she make one using the new pattern I'd love to know how you get on. So cool! I love dragons too but all the other patterns I've seen are so detailed I couldn't bring myself to doing them. I like quick projects that you can see progress on asap LoL! Thanks for sharing this pattern! It will be a fun surprise for my boys :D It's so hard to find awesome patterns for boys. Thank you! Having two boys, and not being very girly myself anyway, I like designing things like this. Soo lovely, queued on ravelry. And prolly one of my next projects. Thank you everyone! Have fun making your dragons - I'd love to see the results. Have you written a book yet? You must compile a book! 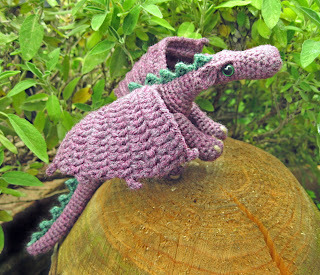 Your work and patterns outshine many of the work that I have seen in amigurumi books here in the US. Thank you! I'd love to write a book - maybe one day. I just finished a burgundy red and black dragon as a gift for a friend. I left a comment before over on the Live Journal site. I found your blog with the revised pattern on it. I've downloaded it and will make one from the new pattern next time. Your pics are a lovely colour combination. Thanks again for sharing this pattern. I'd be happy to send you pics of the two I've made sometime if you like. Thanks Shelley - I'd love to see photos of your dragons. I don't see an email address or a way to attach pics here at all. I could send you them using Etsy though. I have an account over there. That sounds like the best idea Shelley. Sometimes people have their own blog, or are on Ravelry, so they post photos on there and send me a link. I love this dragon! He is so adorable. I love the pattern too, I have now made 3 of these as gifts and every single one has been extremely well received as gifts. Thanks Kelli! I love to think that there are little dragons all over the world! beginning the project. 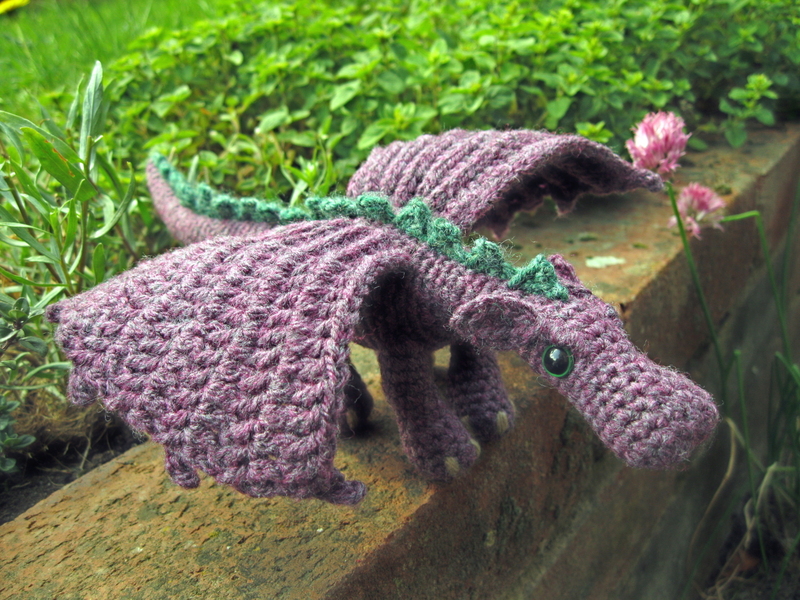 I would love to crochet dragons for my grandbabes for Christmas. Thanks. Thank you! I'm afaid I don't have a video at the moment, so I'll try and explain the beginning. To make the nose you make two 'starts' of 8 sc in a ring. You fasten off one of them, then you put them side by side (to make the nostrils) and crochet around both of them, so the nose is 16 stitches around. I was so charmed by this little dragon. I even made it little, like MICRO. With just 2 strands of sewingyarn and crochethook 0,6mm. Babbette, he's so cute and tiny! I love the colour you used, very vibrant. I made this awhile ago and forgot to leave a comment and thank you for this pattern! It was the first little creature I've ever made and I've learned so much since. I am looking forward to making him again in different colors (this time with the RIGHT side out haha). Thank You very, very much for sharing this pattern for free! Today I have finished my second dragon, because everybody in my family wants to have one after they saw the first dragon. The next days I will put some pictures on my website. Nichole, I love your blue and yellow dragon! There's no way I would guess it was your first amigurumi, and even inside out your stitches look very neat. Clarissa, I'd love to see your dragons, don't forget to send me a link. My first two dragons are online now. I just had a look at them - they look great! I love the colours, and the beads work well as eyes. Your artwork is lovely too. I made this for my niece and she adores it. Thanks for such a cute and adorable pattern. I crocheted mine in turquoise with variegated turquoise/blue/whit wings. It was such fun. Thank you! I love all the different colours people make them in.